This addon allows players to have persistent private storage. Player must approach one of the private storage boxes on the map, and choose the "Access Storage" action. The storage menu is integrated with the existing player inventory. 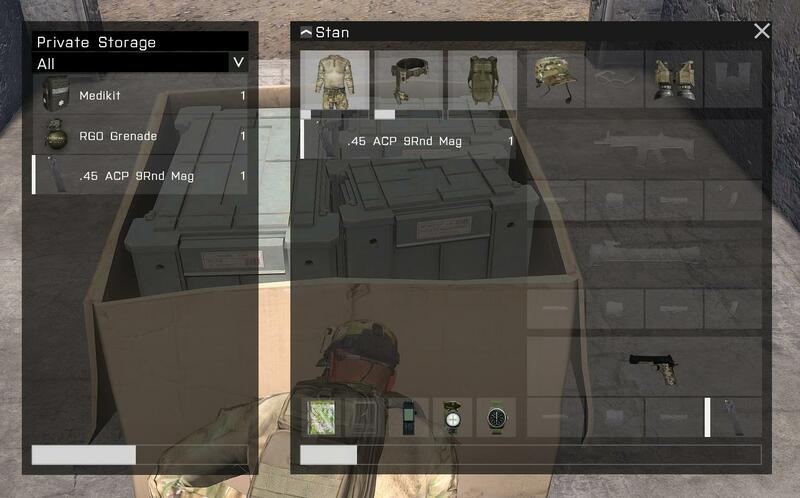 The private storage appears to the players similarly to how crates appear in the inventory. So can u buy this at the store? and put it at your base? No, you provide a list of cities where you want private storage boxes to be available ... using the "ps_cities_whitelist" config variable. When the server starts, it spawns 1 box in each city. If you leave the city list empty, then it spawns one in every city. The boxes are spawned in inside car garage buildings. Well if you add the object to R3F and the store it would be? Yes, it should work with pretty much any object you want from the store. You just need to make sure that it has the variable "is_storage" set to true. The one thing is that the actual stuff inside the "Private storage" wont be saved ... unless you are using Node.js stats. If anyone is up for porting the persistence to extDB, or iniDB ... more than welcome. The way it works is that for each player there is an invisible box of class "Supply500". Since the "Private Storage" for each player is technically just another box, it could be saved in similar way to how regular boxes are saved. The tricky part is that you don't want every player's "Private Storage" box to be recreated after a restart. The "Private Storage" box for a player should only be created when the player joins ... otherwise you'd have thousands of invisible "Private Storage" boxes sitting at coordinate [0,0,1000]. Anyone to port this on extdb version? Would like to see this for exdb as well. Well I like the idea, but it kinda breaks down the whole wasteland idea imho. It takes wasteland more to the Altis Life idea. Weapons, crates and vehicles in wasteland should be losable I think. If you use this you can kinda ditch the whole store in vehicles and crates thing imho. Any guide for Windows Server installation of Node.js? I only see Linux guide on Github. I'm sure about my password. I'm assuming that "Supply500" is the biggest config avaliable, but i can't find any info about "Arma 3 container class" in A3 documentation. Exists any way to add more space to Private Storage? Yes I believe it would be possible by using classname from ammocrates, I'll have to double check to make sure those wouldn't save separately or show in game. I try it without apparent issues.